Fr. Łukasz Szweda was the guest of Our Lady of Czestochowa parish in Sterling Heights. For several years, Fr. Szweda has been working on the missionary posts in Seaford Town and Darliston in Jamaica, and he was very eager to share his story of the missionary work. Fr. Szweda, your decision to leave and begin work as a missionary came after reading a story about the shortage of priests in Alaska. 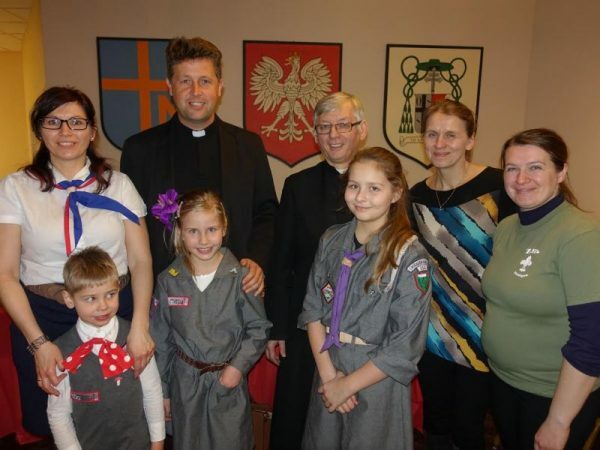 I think there is a sufficient number of clergy in Poland. After 15years of priesthood and approaching my 40th birthday I decided to take up a new challenge and go to places where there is not such an abundance of priests. Initially Alaska was the point of destination. I spent 9 months in Warsaw’s Center for Missionary Formation and my bishop directed me to work in the diocese of Fairbanks in Alaska. For unknown reasons, I was not getting responses to my emails but at the same time, at the center, there was Fr. Marek who was stationed in Jamaica. He told me about the shortage of priests there. I decided that if the bishop of the archdiocese of Montego Bay agrees, I will go and work in Jamaica. I received the approval within one week. And so, I went. I have been ministering to the people of Seaford Town and Darliston, about30 minutes away by car. The most important thing is to be needed and priests here really are needed badly. In my diocese of Montego Bay there are currently 12 priests. Only one of them is Jamaican. Seaford Town did not have a staffed priest for 14 years. One was commuting only on Sundays, and not every Sunday. There are quite large pockets of Catholics but I have not yet seen them in church. Sometimes it’s just the way things turn out after the many years with no priest. I am not a missionary, I am simply a priest. I do not think of myself as a “missionary” at all. It is hard to even tell these days where the missions are. There are no places where people have not heard of Jesus so in the pure sense of the meaning of the word, “the missions” are no longer. That said, almost everywhere we are dealing with the crisis situation where there is no priest. I think it is hard to call a “missionary” today someone who is trying to revive the church, which once upon a time was probably in better shape than it is today. Jamaica is a strange country; the tour guides have pages written about the multiplicity of beliefs present there in per square kilometer. It is true. There is an enormous number of churches here and tremendous chaos in people’s minds. There are various protestant communities; there are the Jehovah witnesses, the Rastafarians, and churches of which I had not heard of before ever in life. There are less than 3% Catholics. It is very common that one family has members living together, belonging to three or more different churches. This complicates things very much. In my parish, I have about 100 people during the Sunday mass. In the church in Darliston, a new community formed which by now counts around 40 members. People are open and full of enthusiasm for Catholicism. We have grown in the traditional, Catholic culture and now you work in the culture so different with such different roots and traditions. How do the differences affect the Jamaican Catholicism? The problem is that there is no tradition of Christianity in Jamaica. The Catholic church there does not have some special customs because it is in minority; people who belong to it come from various walks of life and places. Perhaps my parish of Seaford Town will be a good example. It is very different than the rest of Jamaica. The place, Seaford Town, is also called German Town sometimes. That is because in the 19th century, after the abolition of slavery, immigrants from around Hanover area came here. The man who owned lands back then, the British lord Seaford, once the abolition took place began to look for people to work on his plantations. Slaves did not want to work anymore and it was also the time of extraordinary poverty in Germany. The lord brought some 10 thousand Germans to Jamaica and gave them that land. But it turned out they could not work it. They did not know how to farm it and the climate was taking its toll on them as well. Many died from malaria. They were an enclave of white people who never integrated with the Blacks. Well, they were the ones to build the first Catholic church here, without even having a priest. It was later that a Catholic priest came from Spanish Town. I do not know until today why they built that church, a Catholic church when they themselves were from the area of Lutheran Hanover. It was an isolated but very much alive parish, led by the Jesuits. The Germans would only marry each other which, in consequence, had caused some genetic problems. Everyone was like one giant family. An American priest who served them there at the time noticed, however, that things were heading towards self-destruction. When in the 50s and 60s of the 20th Century Canada and United States opened up a bit more for immigrant workers, this allowed for the white part of the population of Seaford Town to emigrate. And so they have, mainly to Canada. Within a dozen or so years, an entire village emigrated. The new settlers in Seaford Town, who were Black, were not catholic. At some point in time there was a small monastery here and the nuns ran school; the parish died out within 20 years. As I have mentioned earlier, there was no priest here for a long time and my task is the revitalization of that church, rebuilding of that parish which had good old traditions. One could say that today it needs resurrection from the grave. In my second church, in Darliston, the situation was quite deferent. This is a new, young community which started with four people. They asked a Catholic priest if he would come and say Mass for them on Sundays. A foundation called “Food for the Poor” put a habitat together which was turned into a chapel and today this is my church. It is dedicated to John the Baptist in Darliston. As of today, I have around 40 parishioners, of whom none had been a catholic at birth. They are all converts. So, I minister to two entirely different parishes. Back to the original question/clause. Yes, Catholicism here is very different to the one present in, say, Poland. It is so for variety of reasons. First, cultural reasons. The Jamaicans operate on entirely different thinking grounds. They are not concerned with understanding of the faith. For them the important thing is the experience, the living of. Therefore, singing is so critical, to give you an example. Everyone sings Gospel and Christian chants about Jesus. They sing not only in church but they sing at different occasions…at homes, in school before starting the class. For them it is of utmost importance that there be Jesus. They know little or nothing about the church teachings. They were not catechized. Jesus is the only one that counts. They pray to Jesus and they sing to Jesus. In their daily life, they do not follow the Gospel. One of the remnants of the slavery mentality in Jamaica is lack of the institution of ‘family’. This has very negative impact on the growth of children, to whom the parents show little concern. Not uncommon are situations of single mothers rising several children by several different fathers. A funeral in Jamaica is another entirely different experience than it is in Poland. It was, quite frankly, a shock to me. Since the time of death to the funeral, there is about a month-long waiting period, at least a month—often it is longer than that. For the funeral people arrive from all over the world, literarily everyone. The entire family gets together and for three days they celebrate. I often do not even get to say the funeral Mass. Because the members of the family are from very different religious persuasions and they have no idea how to act in a Catholic church. During the funeral, they drink, eat and they dig the grave. The deceased ones are buried at the cemetery which nobody upkeeps, but which is in the proximity of the house. There is no custom developed of visiting or caring for the grave sites. When I wanted to organize people to go to the cemetery and say the rosary, there were no takers. They are afraid of demons. There are no autochthonous Jamaicans; those died out from the flu when the Spanish arrived. The inhabitants of Jamaica are the offspring of the slaves who, in most cases, were brought here from east Africa. They were brought from different places, belonged to different tribes and often were unable to find common communication among themselves. So they created their own language, Patwa, which is the borderline broken English. The traditional beliefs of African origin are still very much alive here. My work here is focused on the Catholics here so they can develop their own identity, knowing what it means to be Catholic. And the sacraments – confession, reconciliation? They are neglected. This probably is related to the permanent shortage of priests. Nobody taught them that. The Sacrament of Matrimony is a rarity here. On the other hand, for the most part they live in those free relationships and few would be those, who would be able to receive the sacrament of reconciliation. I speak about it as if at the meeting of the Bible Circle, but then when I look at them while sitting by the altar I am thinking: Jesus, they do believe in you. I teach them and talk about the sacraments. I cannot judge or condemn them. I leave it all up to the Lord. We have the Sunday School but I teach catechesis individually; they are catechized at different ages and they receive baptism at different ages as well. This is complicated. There are school buildings but nobody really upkeeps them. There is the national educational system and children do not have to pay for their education. Teachers receive their salaries from the government. Now, all the renovations of the school buildings are in the hands of the parish. The Department does not care about it, even though they should. Going to high school means frequently long commutes and, although the education itself is free, many parents do not send their children to school because they cannot afford the commute. I help the children with these costs, so they can study. I have a number of adult parishioners who can neither write nor read. They need help too. During the homily, you have mentioned the clinic. The medical care building stood closed for many years. In the 80s there was a well-functioning medical care building and people from the villages and towns, sometimes close and sometimes far away, would come here. Later, due to various changes and lack of funding, the clinic was closed and has been closed till this day. The building was renovated but there is nobody to work there. We only have a doctor once a week. Perhaps someone would like to come here as a volunteer? They would have a place and stipend for food. The clinic is for the poor and we only charge the absolute minimum, $2.50, to cover the cost of the clinic and medications. What is the average day like in the work of the priest there? Every day is different. For the past few years I have been constantly remodeling something. I work with these people; I don’t want to be a bystander. I organize work for them and I must be with them so that the work moves forward. The work is also the place of evangelization. I think that the work should be given to the ingenuous and not the missionaries. I am not just a priest; I build, I renovate, I do as much as possible, everything. Every day is different and that is very cool. I am here to build a community of Church of Jesus Christ, in a place where Catholics are a minority; the minority demeaned and laughed at. I am not afraid. God really is good. I have made the decision to leave and God is taking care of everything. And I want to assure everyone of this – so they have no doubts, ever. Through the acts of mercy, through charitable help I reach a human being. This is not only help in the material sense, not only in the sense of organizing work but, for example, the concern for the school; there is the health center where I organize medically-focused events. Historically, the Catholic church brings to mind of a Jamaican connotation with the white man who used them as slaves. It is very deeply rooted in heir mentality. Acts of Mercy hep to slowly change the image of the Catholic church. I constantly seek ways of reaching to these people. Their take on the faith differs but this is not up to us to judge that. Let us leave it up to God. I thank you very much for this conversation. I wish that this joy and enthusiasm which you project so very much, keeps you company always. May good God bless you and grant all the necessary gifts. The joy to me is in people who try to grow in the Catholic faith. I am proud that I can save them by showing them the path of Christ.